On February 18th we reported that Alex Clark at Denison Yacht Sales had been appointed the exclusive agent for the Pirelli PZero line of luxury RIB tenders aimed squarely at the superyacht market. 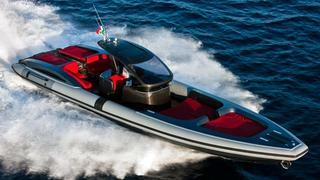 He now reports that a new 2011 Pirelli PZero 1400 mega-tender has been delivered to a happy client in Bonifacio, Corsica. She features twin Mercruiser MAG 430hp petrol engines with Bravo 3 Sterndrives that feature the Axius Premium Sea Core system allowing her to reach speeds close to 60 knots. Custom painted by Dupont in metallic grey with teak decks, she can carry over 12 guests in the luxury and quality synonymous with the Pirelli brand. Asking prices start at €430,000 and each tender is custom built for every client with a long list of available options making every boat delivered unique.